I hope you’ve got your good boots on today, because we’re getting into the tall grass and looking for snakes! Snakes have had a place in magical lore for a very long time. 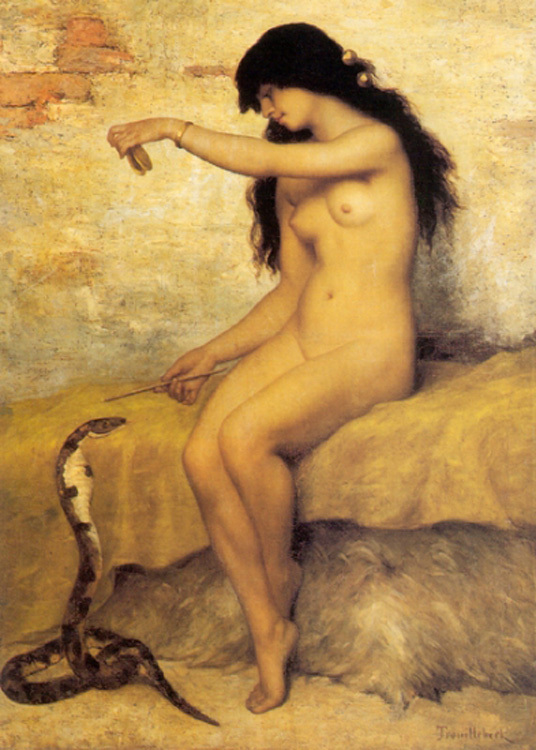 In Ancient Greece, Artemis and Apollo were sometimes associated with snakes. Apollo was famous for slaying the great serpent Python (see Ovid’s Metamorphoses, Book I), and his priestesses were ever afterwards known as the Pythia. Artemis, offended by King Admetus’s oversight of an offering due her, filled his bed with serpents. In Vodoun tradition, the Creator figure is a great serpent, Damballah. Stories of creation and snakes seem to go hand in hand across many cultures. In the New World, snakes have a mixed significance. On the one hand, the biblical story of Eden in Genesis lays a lot of the blame for humanity’s disobedience on the serpent in the garden. At the same time, humanity would be without knowledge without the snake, so there’s more than one way to look at the story. However, if you ask many Christians today who the snake was, they will answer “the Devil” or “Satan,” so for all intents and purposes, mainstream culture takes a fairly negative view of these slithering creatures. That does not mean, however, that all snakes are viewed as little devils, and many folks actually like them. Farmers like snakes because they keep rodent populations down in barns and fields, for example. In magic, snakes are one of the most potent animals you can use. There are several different magical traditions surrounding snakes or their various parts and pieces. Catherine Yronwode notes that “the blood, eggs, heads, flesh, sheds, and skins of all species of snakes are used in jinxing and crossing” and the manufacture of various hoodoo mixtures, like Goofer Dust or Live Things In You poisons (HHRM p. 186). She also mentions that the sheds can be used to calm one’s mind. Other hoodoo-related uses of snake sheds and bones include situations where cunning might be needed, or for luck and power. In this last case, rattlesnake bones and rattles are often used. Musicians who wish to play well and win contests often keep a rattle with their instruments, according to Yronwode. In the case of the Live Things In You curse, powdered snake parts—usually eggs or sheds—are mixed into a victim’s food. The target then feels as though the creature is wriggling around in his body, causing him pain and distress, as well as the feeling that he might be going crazy. You can read more about this kind of baleful working in Superstitions & Folklore of the South, by Charles W. Chestnutt, at the University of Virginia website. Randolph also mentions the snake-handling “Holy Roller” churches sometimes found in rural areas of the South. These churches base their practice on an admonition in Mark 16: 17-18: “And these signs shall follow them that believe; In my name shall they cast out devils; they shall speak with new tongues; They shall take up serpents; and if they drink any deadly thing, it shall not hurt them; they shall lay hands on the sick, and they shall recover” (KJV). “Miss Jewell Perriman, of Jenkins, Missouri, tells me that her Uncle Bill had a secret method of curing snake bite, and people came from miles around for treatment. Uncle Bill belonged to a family of which it was said ‘them folks don’t kill snakes.’ This is very unusual in the Ozarks, where most people do kill every snake they see. When a large copperhead was found in the Perriman house, Uncle Bill caught it with the tongs, carried it out into the orchard, and released it unharmed. His cure for snake bite was known in the family for at least a hundred years…The secret is lost now, for Uncle Bill is long dead, and his son died suddenly without issue. All that Miss Perriman knows of the snake-bite cure is that the snake must not be injured, and that Uncle Bill had a strip of ancient buckskin in which he tied certain knots as part of the treatment. She showed me the buckskin. It was about half an inch wide, perhaps twelve inches long, carefully rounded at the ends. Three knots had been tied in it, one in the middle and one at either end” (Randolph, Ozark Magic & Folklore, p. 159). Wouldn’t you love to know what that secret was? I sure would! I suspect that snakes will always have a place in magical lore. They have the ability to slide between upper and lower worlds easily. Some can kill with a bite, but also provide useful services to us in many ways. They seem to show up everywhere in the world (except Ireland…but that’s a completely different subject) and they always connect to something primal in us: fear, knowledge and gnosis, or even sexuality. I’ll be keeping my good boots on when dealing with them, but I definitely have a particular love for these critters. This entry was posted on April 21, 2010 at 9:30 am and is filed under History & Lore. You can subscribe via RSS 2.0 feed to this post's comments. Not sure about in the new world (I’m british myself, but still get great enjoyment and a wealth of info from both this blog and your podcasts), but in many european cultures and traditions snakes often represented family or household spirits. In ancient greece, the Agathos daimon (good spirit) was often represented as a snake, as was zeus in certain guises. The minoans and myceneans were also VERY snake orientated in many of their practices, though I couldn’t go into any detail off the top of my head! I’m glad to have some Old World folk here, actually! While I definitely keep the focus on New World stuff, there is certainly a connection back across the Atlantic that is worth remembering. Also, many thanks for your contributions to this post! I highly recommend anyone reading doing some Google searches for some of the things Emma mentions. You’ll learn to love snakes before you’re done (or at least, love them in a theoretical way). I’m enjoying poring over all of your old posts and podcasts. This one really caught my attention. The black woman who helped raise my father and his siblings and then eventually me and my brother, lived in a small cabin toward the back of our farm in West Tennessee. She had a righteous hatred of snakes and I definitely recall her burning old shoes in a fire in her front yard -and I want to say it might have been old tires- as well as a way to ward off snakes. I have been trying to find this in the hoodoo line of magicking, but saw the reference in Ozark. It might be common to both – I have no doubt given her age (she’ll be 100 years old in August) and the area we were in, that she practiced or enlisted someone who practiced hoodoo at the time. Keep up the good work, I’m quickly becoming one of your biggest fans here. That’s a wonderful bit of lore! And you’re lucky to have someone like that in your life who clearly knows a lot about these almost-forgotten methods and beliefs. Thanks so much for sharing this, and for your lovely comment!